Does the United States benefit? The relationship between the United States and Mexico is at the center of a fierce political debate over immigration, trade and national security. Republican presidential nominee Donald Trump accuses Mexico of stealing U.S. jobs and vows to build “a big, beautiful, powerful wall” to bar “rapists” and criminals from crossing the 1,951-mile border between the two countries. Democratic nominee Hillary Clinton has taken a far less inflammatory stance on Mexico, saying her party “builds bridges, not walls,” though she once supported 700 miles of border fencing to stem illegal immigration. 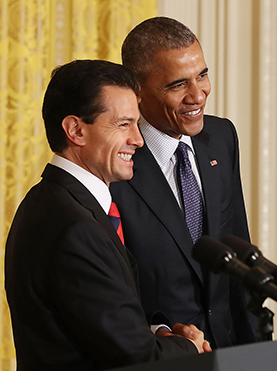 Meanwhile, President Obama, while decrying the “scourge” of violence from Mexican drug cartels, defends the U.S.-Mexico relationship, saying “the very character of the United States is shaped by Mexican-Americans who have shaped our culture, our politics, our business.” The mixed views underscore the complex ties and growing tensions between the United States and Mexico, an emerging economic power with an expanding middle class but a nation troubled by political corruption and continuing drug-related violence.